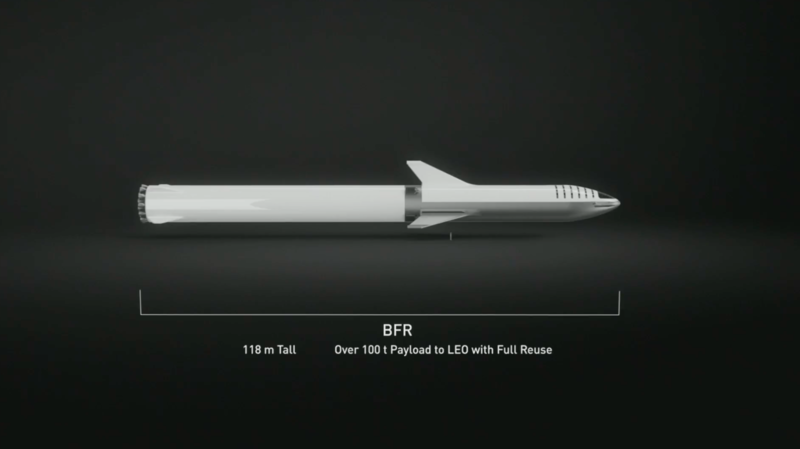 EDITOR’S NOTE: Updated with BFR design details. Promising to take a half-dozen or more artists with him on the journey, Japanese fashion magnate Yusaku Maezawa said Monday he has paid a deposit for a ride around the moon aboard SpaceX’s planned BFR rocket as soon as 2023, a financial infusion that will help bankroll development of the company’s futuristic interplanetary transporter. 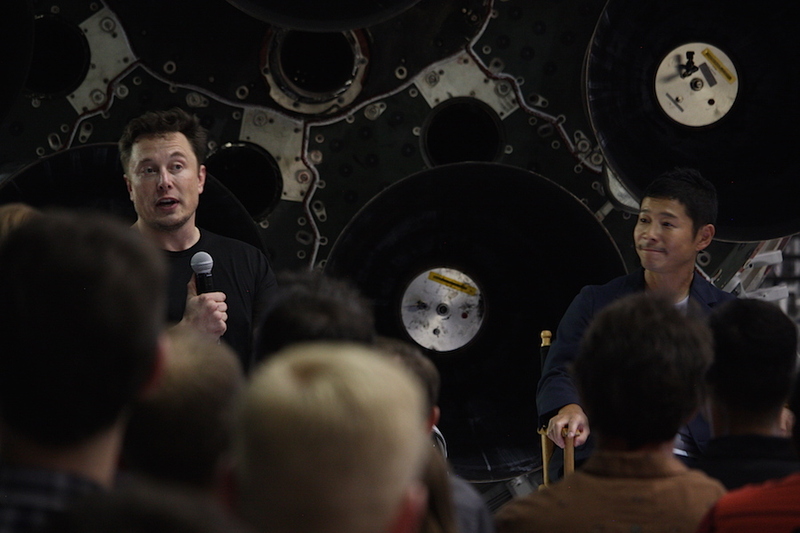 Maezawa and SpaceX founder Elon Musk announced plans for the moon mission Monday at the company’s rocket factory in Hawthorne, California. “Finally, I can tell you that I choose to go to the moon,” said Maezawa, the 42-year-old founder of Zozo, Japan’s largest online fashion retailer. But he doesn’t want to go to the moon alone. Maezawa said he will invite artists to accompany him on a trip around the moon and back to Earth, hoping to inspire the passengers — musicians, painters, photographers, film directors, fashion designers, sculptors, or architects — to create new works to reflect their experiences in deep space. 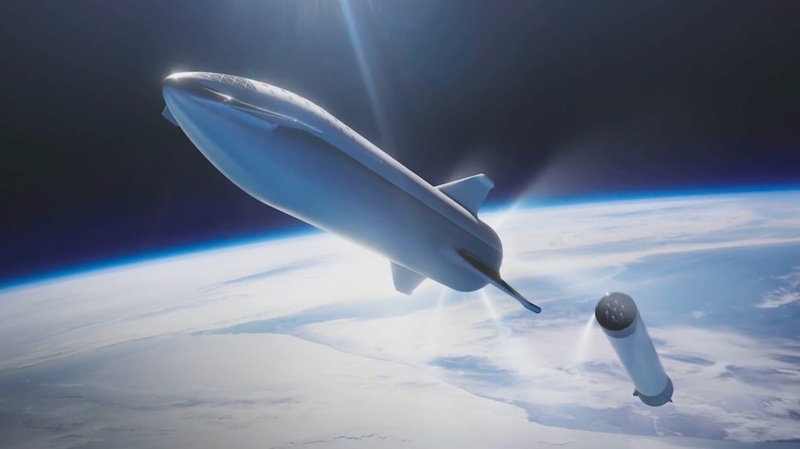 The artists and Maezawa will launch on SpaceX’s planned BFR vehicle for the the trip around the moon and back to Earth. SpaceX’s BFR — or Big Falcon Rocket — project is designed to help achieve Musk’s vision of one day settling Mars. The two-part vehicle, comprising a booster and an upper stage dubbed the Big Falcon Spaceship, will be entirely reusable and will be refueled in space, making it capable of flying to the moon, Mars, and other destinations throughout the solar system carrying as many as 100 passengers, Musk said. “BFR is really intended as an interplanetary transport system that’s capable of getting from Earth to anywhere in the solar system as long as you establish propellant depots along the way,” Musk said. SpaceX has also teased the idea of using the super-heavy-lift BFR system for high-speed, point-to-point travel around Earth. The new spaceship will using articulating fins and a heat shield to re-enter Earth’s atmosphere, or descend through Mars’s rarefied air, before rotating to an upright orientation for a propulsive landing using the craft’s Raptor engines, touching down in a similar manner to SpaceX’s Falcon 9 rocket boosters. The ship will also be able to land on airless worlds like the moon, using rocket thrust for all its braking, Musk said. Maezawa calls his initiative “dearMoon,” and the process of selecting the artists for the lunar mission has not yet started. Maezawa did not disclose how much he will pay for the trip around the moon, but he confirmed he has paid a deposit to SpaceX. Musk said Maezawa made a “significant deposit” that will have a “material impact” in the development of the BFR system. Musk said he expects development of the BFR system will cost anywhere from $2 billion to $10 billion, a wide range he narrowed to an estimate of roughly $5 billion in response to a question from a reporter. In additional to the numerous technical challenges in building and flying such a vehicle, Musk is also counting on revenues from satellites launches, crew and cargo missions to the International Space Station, and SpaceX’s planned Starlink broadband network to pay for the endeavor. Maezawa’s financial commitment will also funnel directly into work on the BFR program, according to Musk, and SpaceX’s ambitious plans need money. “Private customers, or any customers, for BFR are incredibly helpful in funding development of the rocket,” Musk said. SpaceX is a leader in the global commercial launch market, and the Air Force has tapped the launch provider to begin delivering some of its satellites to orbit, giving SpaceX access to a lucrative line of Pentagon contracts. SpaceX is also one of two companies funded by NASA — along with Boeing — to build commercial crew capsules to ferry astronauts to and from the space station. But the Starlink network is still in its infancy. Filings with federal regulators suggest SpaceX plans to deploy up to 12,000 small satellites in low Earth orbit to provide global broadband services, and the first two Starlink test satellites launched in February. SpaceX is one of several companies building broadband “megaconstellations,” and the competition in the satellite broadband market is hot. “We need to seek every possible means of funding,” Musk said. Musk said the circumlunar flight will be risky. No humans have traveled beyond low Earth orbit, a region a few hundred miles above Earth, since the last Apollo moon landing mission in 1972. SpaceX announced in February 2017 that it had received a deposit for two private passengers to launch on a circumlunar flight around the moon aboard the company’s Crew Dragon spacecraft, the capsule planned to carry astronauts to the space station, which orbits around 250 miles (400 kilometers) above Earth. Musk said Monday that Maezawa was one of the would-be space tourists who initially signed up for the Crew Dragon lunar flight, which was intended to launch on a Falcon Heavy rocket. When Musk announced the Crew Dragon lunar flight last February, he said the mission around the moon could launch by the end of 2018. SpaceX since scrapped those plans, opting to move on to the BFR project. “With Falcon Heavy and Dragon, we would have had, essentially, for a trip around the moon only room for two people … It’s about the size of an SUV inside there. “BFR has got room for 100, and we said, well, maybe it’s wise on this to have about a dozen people or thereabouts on the first trip into deep space, and (Maezawa’s) very graciously offered to provide those seats to artists and cultural influencers — basically key influences on society. 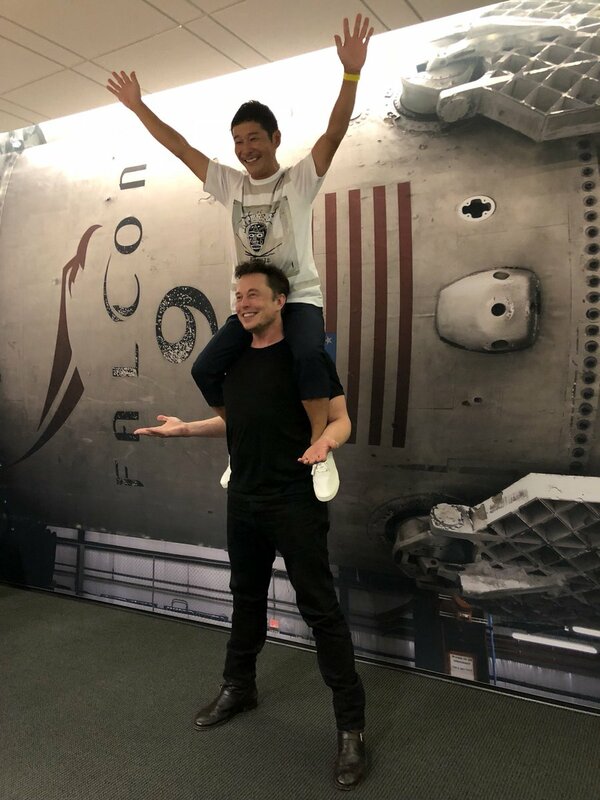 Maezawa invited Musk to join him on the trip around the moon, but Musk was non-committal Monday on his participation on the flight. Musk has a history of stating ambitious schedules for SpaceX’s rocket developments. He announced plans in 2011 to launch the first Falcon Heavy rocket by 2013, and the heavy-lifter finally lifted off for the first time on a successful demonstration flight in February. 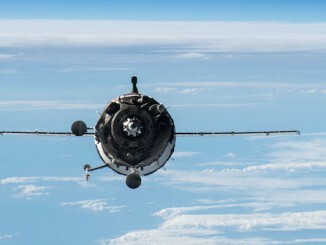 Space Adventures, the company that has arranged flights by paying passengers to the International Space Station, has also outlined plans for a circumlunar flyby mission with two “space tourists” and a professional cosmonaut using an upgraded version of Russia’s Soyuz crew capsule. Space Adventures said in 2014 it received deposits from two passengers for the moon mission, with seats selling for $150 million a piece. The Russian-led tourist flight to the moon has not materialized, but a section dedicated to the circumlunar flight remains on Space Adventures’s website. Maezawa and his shipmates will launch on a “free-return” trajectory, looping around the far side of the moon without entering lunar orbit, following a path similar to the Apollo 13 mission, which aborted its moon landing after an explosion of one of the craft’s oxygen tanks. In a tweet, SpaceX said the spaceship will get as close as 125 miles (200 kilometers) from the lunar surface, with the mission set to last about a week. 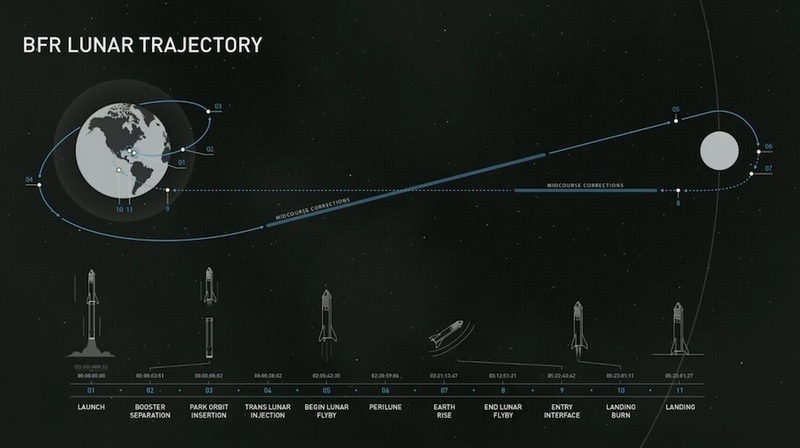 An illustration of the mission’s trajectory provided during SpaceX’s webcast Monday’s announcement suggested the flight would last just shy of six days from takeoff to touchdown. Musk first unveiled the BFR architecture in 2016 at the International Astronautical Congress in Guadalajara, Mexico, then updated the design in a follow-up presentation last year at the IAC in Adelaide, Australia, settling on a smaller rocket than he originally envisioned. Musk revealed further adjustments to the BFR design Monday, including a reconfigured propulsion system on the spaceship section of the huge vehicle that will apparently result in a slightly reduced carrying capacity for the system, at least in in its initial version. But the BFR — in its current iteration — dwarfs all rockets currently flying in dimension and capability, and would stand taller than NASA’s Saturn 5 moon rocket, while producing nearly twice as much thrust at liftoff as the Apollo-era launcher developed in the 1960s. With its booster and spaceship stacked together, the launcher will extend to a height of 387 feet (118 meters), slightly taller than the BFR configuration described by Musk a year ago in Australia. 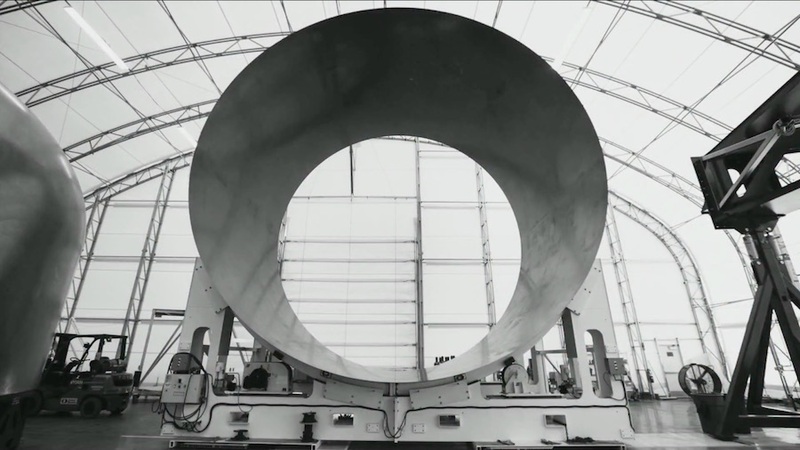 The nearly 30-foot-diameter (9-meter) booster will produce nearly 12 million pounds of thrust from 31 Raptor engines, a new powerplant currently being ground-tested by SpaceX which burns a mixture of methane and liquid oxygen. The booster will come back to Earth immediately after launch for a vertical propulsive landing and reuse. 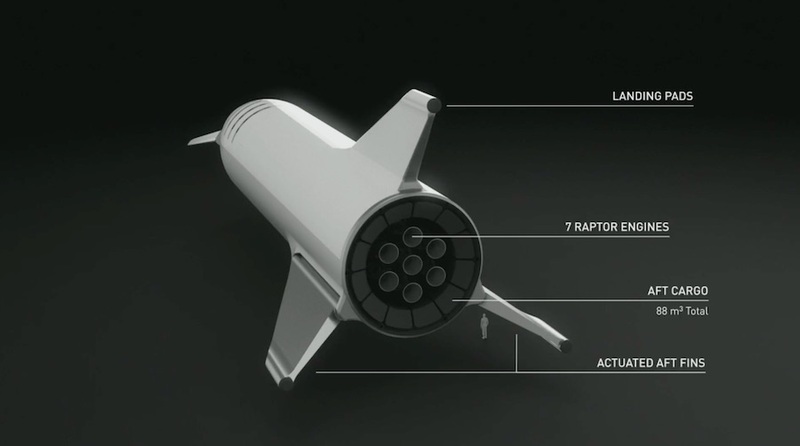 The spaceship to be mounted on top of the BFR booster is part-upper stage and part-interplanetary ship, using seven Raptor engines. After originally considering putting Raptor engines on the BFS with wider nozzles optimized for efficiency in the vacuum of SpaceX, Musk said Monday the ship will use the same engines as the booster, which are rated for sea level. That change apparently comes with a reduction in lift capability. The version of the BFR described Monday can deliver up to 100 metric tons — about 220,000 pounds — to low Earth orbit, Musk said, down from 150 metric tons — 330,000 pounds — in the earlier version of the vehicle. The system could haul a similar amount of cargo, including people, to Mars with in-space refueling. Musk said the vacuum-rated Raptor engines could be added to the spaceship in a future configuration. He also said the latest BFS design has more internal volume than the previous iteration, and features two forward and two aft actuating fins. A third fin-like structure will join the two articulating wings at the rear of the vehicle, and all three fins will act as landing pylons for the ship’s touchdowns. SpaceX has started building hardware for a prototype of the BFR, and the company has selected a site at the Port of Los Angeles for full-scale production of the vehicle. Musk said the latest refresh in the BFR’s planned appearance and functionality, which he admitted was at least partly driven by aesthetic concerns, could be the project’s last major design change. “I feel like this is the final iteration in terms of broad architectural decisions for BFR (and) BFS,” he said Monday. “There’s more than one way to solve this problem, and the prior design, the iteration before this, decoupled the landing legs from the control surfaces, and had essentially six legs and then two actuating rear flaps. “I actually did not like the aesthetics of that design, so we have the three sort of large legs, with two of them actuating as body flaps or large moving wings, effectively,” he said. “I think this design is probably on par with the other one, it might be better. Test flights of the spaceship portion of the BFR system could begin next year, starting with low-altitude “hopper flights” akin to the takeoff and landing tests conducted by SpaceX’s Grasshopper prototype before engineers attempted landings of Falcon 9 rocket boosters. According to Musk, SpaceX will base the first BFS hop flights from the company’s launch site in South Texas, which is still under construction after a groundbreaking ceremony at the location on the Gulf of Mexico near Brownsville four years ago this month. SpaceX has not committed to a launch or landing site for the BFR’s first orbital missions. He said SpaceX will conduct “many such test flights before putting any people on-board,” likely including a flight around the moon without any passengers before committing to launching Maezawa’s circumlunar mission. Musk went out of his way during Monday’s announcement to say SpaceX’s top priority remains the debut of the Crew Dragon spacecraft for NASA, which awarded Musk’s company a $2.6 billion contract in 2014 to develop and fly the human-rated capsule on crew rotation missions to the space station. He also cited national security satellite launches for the U.S. military as a key focus for the company in the near-term. The BFR initiative currently represents less than 5 percent of SpaceX’s expenditures, Musk said, but that will increase once engineers wrap up development of the Crew Dragon, perhaps as soon as late next year. Assuming the BFR’s circumlunar passenger flight is not delayed, it would launch a year after NASA currently plans to send a team of astronauts around the moon on the agency’s Space Launch System rocket and Orion spacecraft. Like some of SpaceX’s rocket and spacecraft projects, the SLS and Orion programs have suffered years of delays. The first combined test flight of the Orion capsule with NASA’s new mega-rocket, which in its inaugural configuration will have a payload capacity somewhat less than BFR’s, is now planned no earlier than 2020 on an uncrewed mission, followed by the first piloted voyage two years later. NASA has outlined plans to use the Space Launch System and Orion spacecraft on a series of human missions in the 2020s to construct a mini-space station in a distant orbit around the moon. 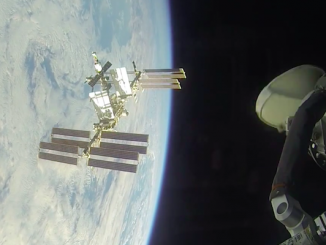 The so-called “Gateway,” comprising parts from NASA’s current space station partners in Canada, Europe, Japan and Russia, will host astronauts for months-long stays, eventually operating as a staging base for robotic and crewed landings on the lunar surface. NASA has spent more than $20 billion on the SLS and Orion programs, along with their associated ground systems the Kennedy Space Center, since 2012. Flight hardware for the first two SLS/Orion flights is in assembly and production. How SpaceX’s plans fit — or don’t fit — into NASA’s exploration strategy remains uncertain, but Musk has more prominently highlighted the BFR’s ability to land on the moon, as a stepping stone to Mars, since NASA started working on the Gateway concept and the Trump administration directed the space agency to return astronauts to the lunar surface. 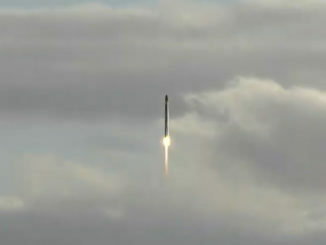 Musk said his vision for SpaceX remains a human mission to Mars, and expanding human presence into the solar system. He emphasized the upcoming first demonstration flights of the Crew Dragon spacecraft as “fundamental to the future of SpaceX,” adding that the capsule’s first unpiloted launch into Earth orbit is scheduled for December — a month later than previously announced — and the Crew Dragon’s first test flight with NASA astronauts is still expected in the second quarter of 2019.